Ceja Tasting Salon on First Street- including Salsa Lessons on the weekend! A friend was in town (Josie) and she wanted to visit the Ceja tasting salon up the street. I know Javier well and he was there with big smiles as we entered the door. He always makes you feel as though you are family and are coming home. 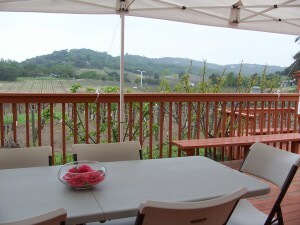 We sat and enjoyed a tasting- we were specific on what we wanted- of Chardonnay, Pinot Noir, and Cabernet. They have many other wines for you to try, but we were trying to decide on wine for an upcoming event. The Chardonnay was an immediate hit for both of us, buttery on the nose but not on the tongue. Not too fruity, and not oakey. I might say “well-balanced”. That was a definite yes for us. We moved onto the Pinots, with a selection from both Sonoma and Napa. The Sonoma was big on the nose, very fruity in aroma, and was hearty on the tongue. We both enjoyed it. The one from Carneros was lighter, more subtle, and less inviting. 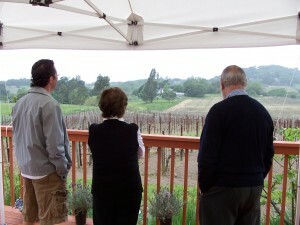 Then we started talking with Javier and ten minutes later returned to the Pinots. Oh my! The Sonoma was still there- hearty and fruity. Yet the Carneros Pinot opened up: the aroma wafted up with bright fruit, and when we took a sip we both experienced an elegance in the wine that wasn’t there initially. Aha! This Pinot was acting coy and shy, but opened up with time. We loved it. 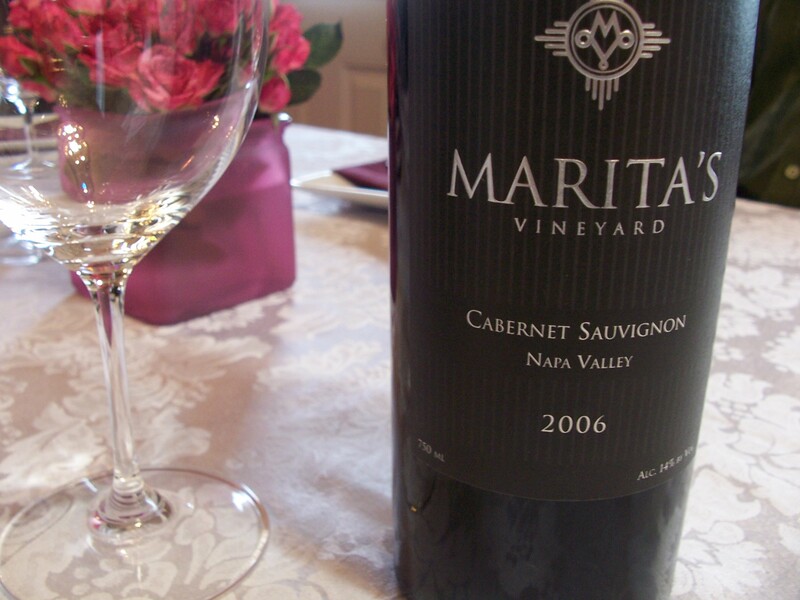 The Cabernet was delicious, light on the fruit and light on the palate; not the big Napa Cabernet we often find in the valley. Yet Josie wanted something bigger. ”Delicious,” she said, “but I want something bigger.” So, we settled on the Chardonnay and the Carneros Pinot and continued our search for a Cabernet (more on that later!). Javier reminded us that the artwork on the wall changed out quarterly and that they offered Salsa lessons and dancing on the weekends- a big draw for Saturday nights when you are looking for something fun to do! And if you’re not familiar with the Ceja family, Javier will fill you in with all the details of this “vineyard worker to vineyard owner” Latino family who welcome you simply with the words: “Mi casa es su casa.” The price on the wines range fro $20 to $50. 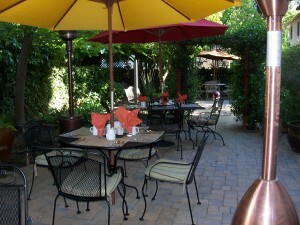 The Garden is open for service! Yes, the season opener has come to The Inn On First. Our garden is once again lush and green, flowers blooming, everything growing, and the weather has been cooperating nicely. Jamie pulled out the umbrellas, set up the cushions, unwrapped the patio heaters for those cool mornings, and set the table for breakfast. It was magnificent. I wanted to try some new recipes for this new season and two of them fit nicely: chocolate pasta with tofu-walnut sauce and a poached egg, and sushi omelets filled with salted zucchini and green onion served with hot mustard and wasabi cream. Our guests loved them. The chocolate pasta, made with cocoa powder and not sweet chocolate, presents just a hint of cocoa in the back of your throat and pairs nicely with the walnuts. The tofu is a low-fat version of ricotta cheese and allows dairy-free guests to enjoy the meal. The sushi omelets are great for gluten-free and/or dairy-free guests. The dish looks cold when it arrives, but as you take a bit you realize that it is hot, with a crusty, crunchy exterior and a soft and sticky interior. When Jamie tells me “You can serve these to me any day” I know it is a winner. My gratitude to all of my guests who continue to allow me to explore new ideas for breakfast! I have another 15 in the works! Arbuckle grits with cheddar sauce. Steamed buns with burrata cheese. Beets, roasted potatoes, borscht sauce, and greens. The Snake Salad with beautiful micro-greens and a light dusting of “dirt” (dehydrated mushrooms and walnuts). Potato and mushroom “pillows” in a lovely mushroom reduction sauce. Braised fennel (I normally won’t touch it as it can be too pungent). Sunchokes. Schramsberg Blanc de Blanc. Yes, this restaurant still delights and tickles me whenever I visit. With an ever-changing menu I continue to be intrigued and challenged to try things I have tired of or won’t cook for myself; and find myself enjoying every last bite. This restaurant is not for everyone. For serious foodies who want a food adventure, you’ll love it. Paloma Winery. A very, very small family-owned and operated winery up on Spring Mountain. You go for their Merlot, you stay for the view, and you walk away with an appreciation of what the family has accomplished on their hillside vineyards. Barbara Richards, or her son, Sheldon, will be your host for the visit, and give you a brief history of the family. As this is their home, with all those wonderful touches of personality, you are invited to become a part of the family as you sit out on the deck or at the dining room table. Their most noted wine is Paloma Merlot, a world-class red wine capable of improving with bottle aging for 10 to 15 years, running around $50/bottle. As you sit and listen to the family’s story, of Jim Richard’s death in recent years, and sip on a glass of Merlot, you will begin to understand the simple attraction of Napa- people, grapes, wine, ambience, views, life cycles. It is wrapped all together here simply and well. This should definitely be a stop for anyone spending the day on Spring Mountain (Pride, Barnett, Terra Valentine are also there).